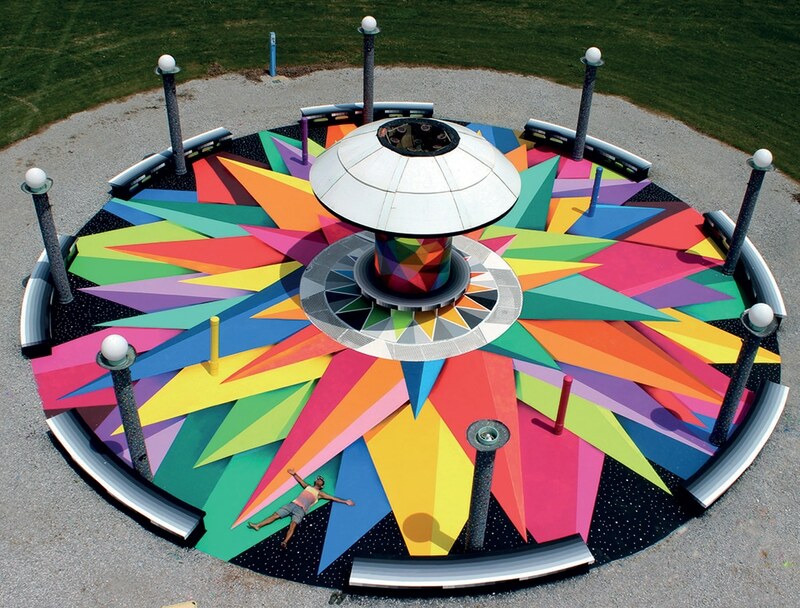 You might not know Okuda San Miguel, but if you ever saw just one of his artworks you would recognise his distinctive style anywhere. From a painted pizza oven in a Madrid restaurant to his collaborations with global furniture and design brands and solo exhibitions in London and LA, he mixes the legends and myths of old cultures with a contemporary outlook on his surrealist inspiration. 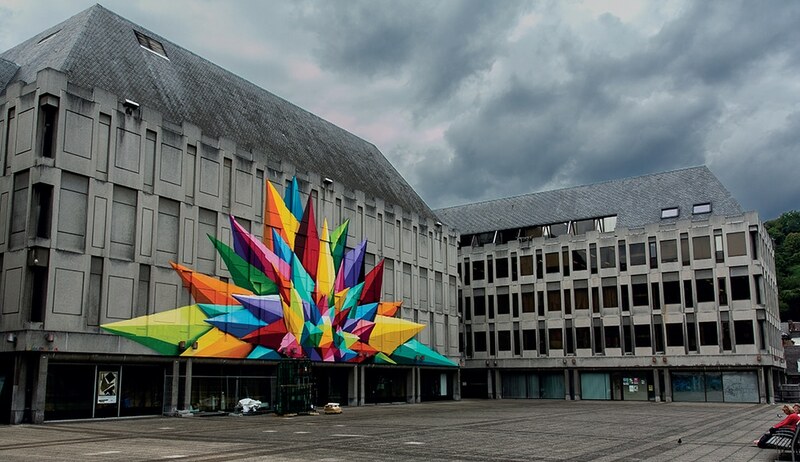 Okuda’s large-scale murals are what brings him world recognition. Some of them are commissioned by galleries and local authorities, but many are crowd-funded. 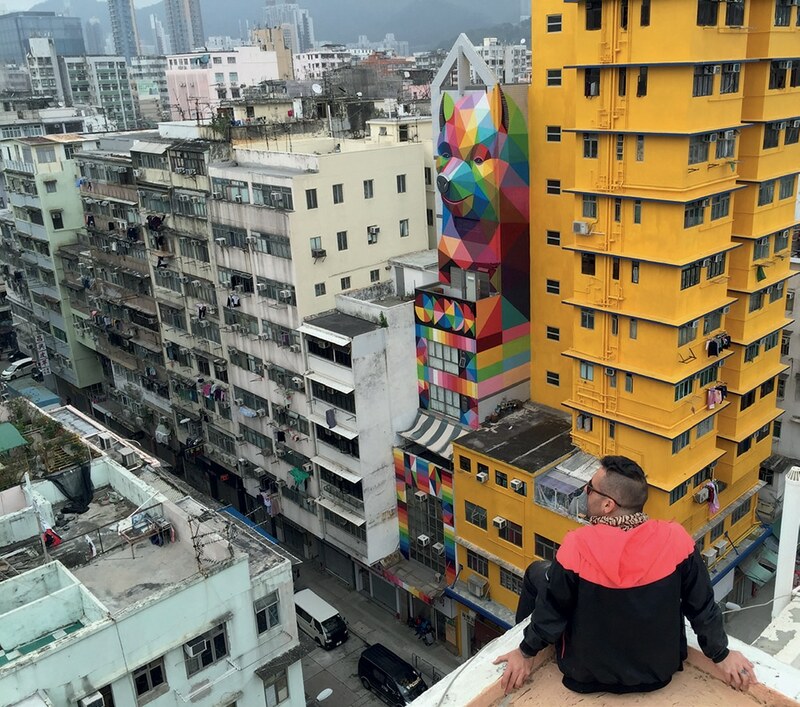 From India to Ukraine, and from Canada to South Africa, his murals bring life and colour to the poorest, greyest and least privileged neighbourhoods. 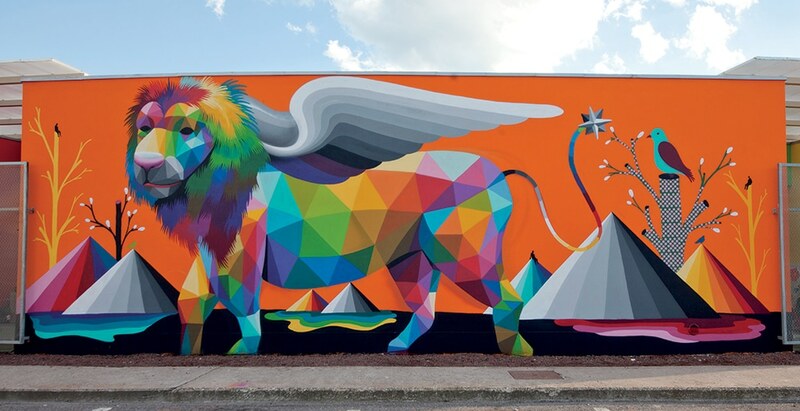 His unique iconographic language of geometric rainbow patterns and fantasy-like characters has made him one of the world’s most recognisable street artists of today. 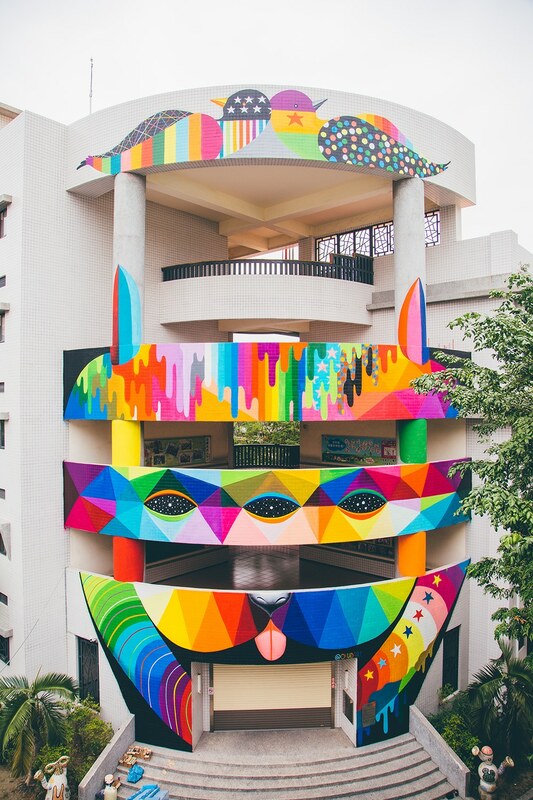 Okuda says that he does not follow a particular theme when he creates, more than anything he wants his audience to reflect upon his artwork freely. His works often raise questions about existentialism, the universe, the flow of time, the meaning of life, and the contradictions between the present and our roots. 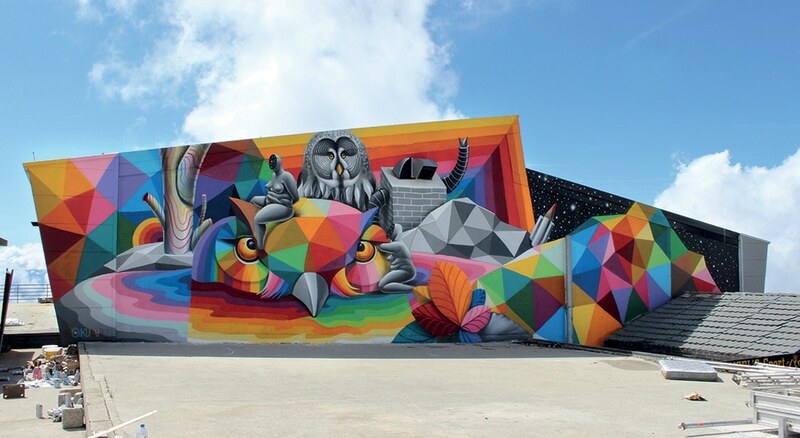 Born in Santander, Okuda began producing graffiti along railroad tracks and on abandoned factories in his hometown, already establishing his unique style. After receiving a Bachelor of Fine Arts from the Complutense University, he remained in Madrid, where he now has a studio and a big team, which lets him focus on the multitude of projects he is working on all over the world. 1. You have previously said that the primary goal of what you do is to “breathe life into lifeless objects”. Does that mean that you find modern design lifeless? Yes, of course. What I think it lacks is the connection with the roots, which I always try to evoke in my art. I find forms and designs compatible with modernity in old cultures, indigenous worlds and ancestral connections. Whether I find inspiration in Asia, America or Africa, I try to take the feelings I get from these explorations and show them in my own works. 2. You have done projects that have a lot of social impact all over the world. What has been your most eye-opening and inspiring experience? 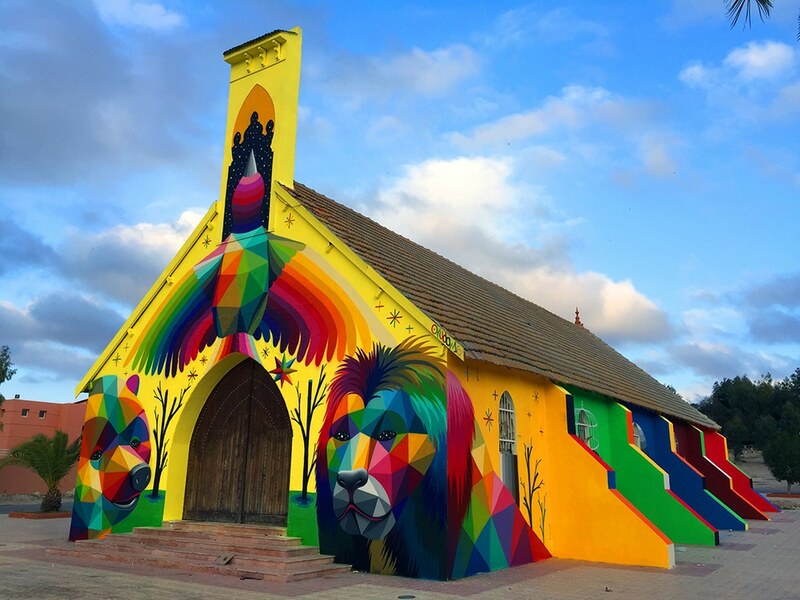 I had a really great experience in Morocco, where I transformed an old abandoned church that no one wanted to go to. After I finished a lot of Muslim people came up to me to express their gratitude and take pictures. 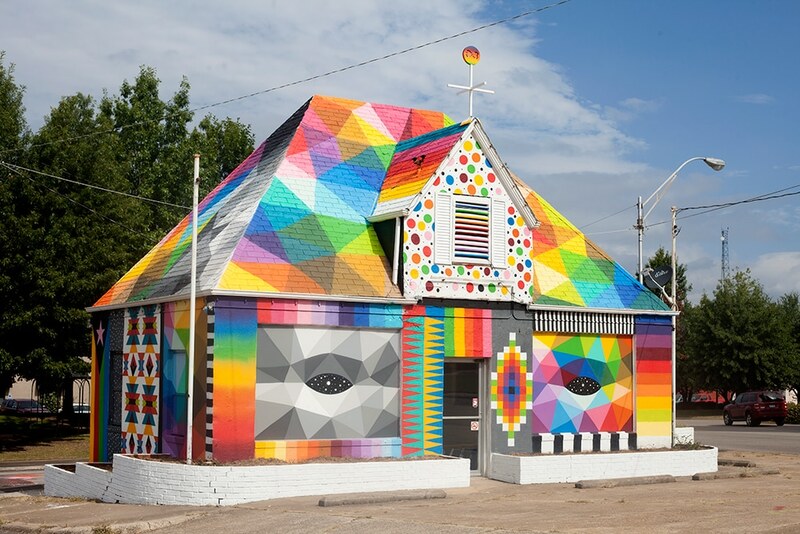 The church became the coolest place in their tiny village. Every time I go to India I also bring back amazing memories. The people there are very special. They might have nothing, but they still find reasons and energy to only see the good and be happy. They truly feel art. A single painting I had done there would often change the mood in an entire neighbourhood. It’s very important for me to keep the balance between the work I do in big cities and with big brands and social projects. Art removes boundaries between cultures and religions, and to me it’s the most beautiful thing. 3. 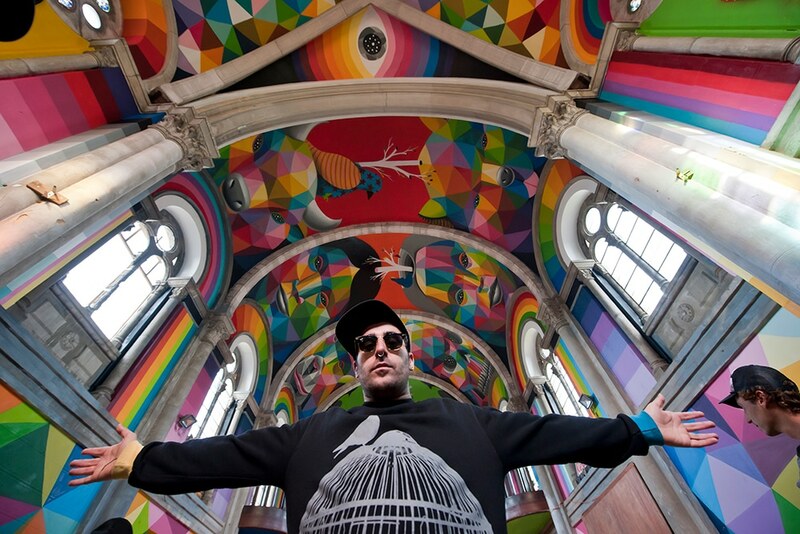 You say that murals are your favourite medium. Why is this? I came from painting in the streets with spray-paint and to this day it’s what I feel most comfortable with, so murals were just a natural progression. It’s a quick way to make a big difference to the space around you. The importance of my work – to me – is to change places around me, to transform grey boring concrete into something full of life. People need colour in their life, especially in cold countries like Russia! 4. Surrealism obviously has a lot of influence on your work. If you could do a project with Salvador Dali, what would you want it to be? When I was studying fine arts at university I discovered the works of surrealists. I fell totally in love with them: Max Ernst, Salvador Dali, René Magritte and Bosch, who was already a surrealist 500 years before their time – he truly impresses me. I feel like I share the same “vibe” with those artists and feel comfortable in the presence of their work. Certainly, if I could work with Dali I would just want to have him to myself for a few days – to chat! We would brainstorm lots of different ideas and then paint a huge mural. He always painted in such great detail, but his works were not big in size – so just imagine how incredible it would look on a great scale of a big wall. 5. What was the most unusual invitation to a project you ever received? Nothing is too unusual for me – I need it to be able to grow as an artist. I recently painted the façade of a 19th century palace in France and that was great as I love to paint classic architecture. Giving the life back to old places is what I want to keep doing, no matter how unusual those places are. 6. 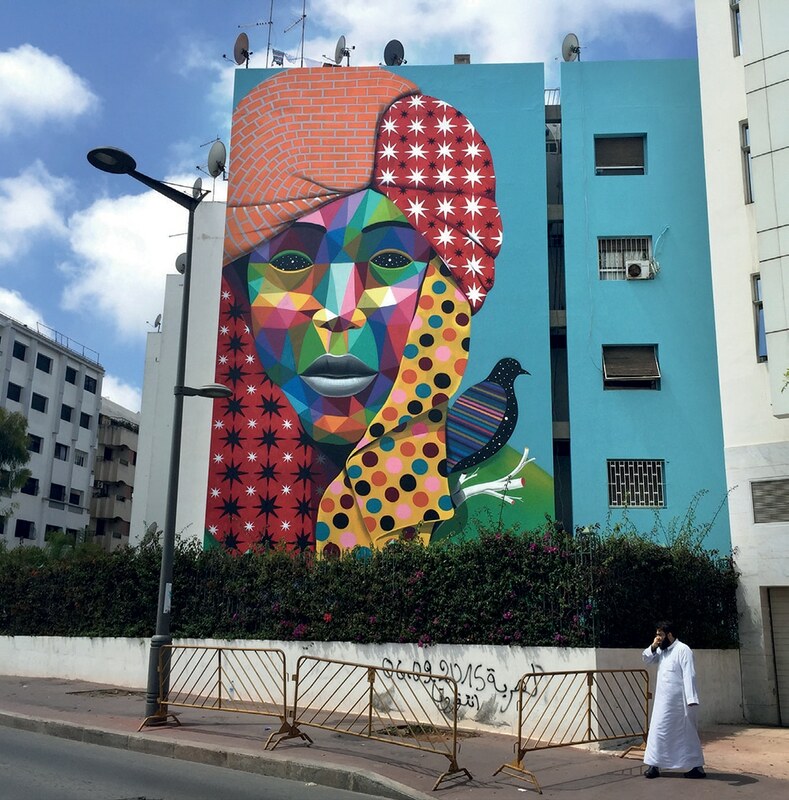 In 2014 you were included in the top 100 of the Urban Contemporary Art Guide. Is this how you would want to be remembered in a hundred years? I’m very focused on creation and it’s what I need to do to be happy, so to be honest I didn’t think about it much. I need to explore and grow as an artist – for me and my career. But I think that’s good enough. A lot of school kids have seen my artwork now because of that recognition, it has become their reality – to know that you can establish yourself with an unconventional street style like mine. 7. The colour palette of your artwork has been characterised as “psychedelic” (Widewalls). Do you believe that art should immediately catch one’s attention as opposed to seamlessly blending into the scenery? Yes, definitely. The contrast between my artwork and the surroundings is so great, it’s like an LSD vision. Even between all the branding and the advertising my work stands out and everyone who comes across it pays attention. Maybe it’s only for a second, but in the end they will remember it – and to be remembered is the ultimate goal, isn’t it? 8. Your next solo project in Denver, Colorado is called “The plastic island”. Do you often address environmental issues in your artwork? I live in my pink cloud, you know, and I don’t watch the news very often. But when an issue like this comes to my attention I feel a strong calling to do something about it. For the same reason I painted a picture of Donald Trump with “Viva Mexico” written on his face for my first solo show in the US. This time in Denver I feel like it is time to draw attention to the issue of a growing patch of plastic debris that was found in the Pacific. But I want to present it in a funny way, as if the island was a normal tourist destination in the future. It’s a horrifying dystopia – to imagine a holiday on a genuine sea dump, but it might become real much sooner than we think. It might be funny, but I want people to reflect on it, to realise how serious the issue is. I think environmental pollution is the most important problem of modernity. And the second biggest is that we are polluting our minds with TV and all the other distractions, it takes us away from our spiritual roots. 9. If it wasn’t Madrid, where would you move to? New York, l love it. Maybe in a few years I will be able to have two studios, to spend spring there and winter in Madrid, and summer of course in Santander with my mum and family. The first time I was in Tokyo I also felt very comfortable and thought of living there. 10. Last but not least…What music do you listen to when you are high up in your crane painting? My music taste is very multicultural, just like my work. It’s mostly electro, a lot of kwaito (African electro), with some trap and hip-hop. I also love bossa nova. One of the best things about travelling is that I constantly meet new people who show me new music. If I had to pick one artist I would say M.I.A. To me what she does is real art.